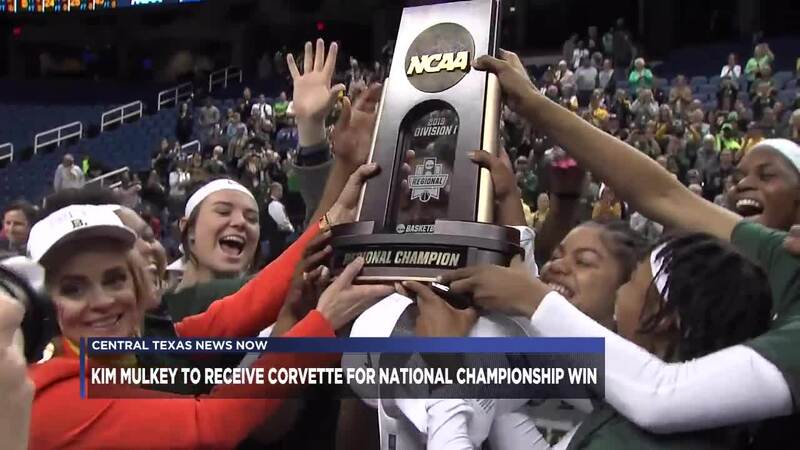 WACO, TX — Lady Bears Basketball Coach Kim Mulkey was presented with a Corvette by Allen Samuels for her National Championship victory on Monday. She will have the Corvette to enjoy for an entire year. Mulkey has received a Corvette for a year with every victory - and this year's Corvette will come with extra "sizzle." Allen Samuels said they selected a special edition Corvette, the 2019 Corvette Z06. “We are thrilled for the Lady Bears and Baylor Nation upon winning another championship. The Bears are all about performance, and we think Coach will be more than impressed with the looks and performance of this Z06,” said Robert Reck, General Manager of Allen Samuels Chevrolet Buick GMC in Hearne, the presenting dealership. The Lady Bears defeated Notre Dame 82 to 81 for the National Championship on Sunday. Mulkey was also named AP's 2019 women's college basketball coach of the year .